AIIMS Bhubaneswar All India Institute of Medical Sciences, Bhubaneswar is one of the new apex healthcare institute s being established by the Ministry of Health & Family Welfare, Government of India under the Pradhan Mantri Swasthya Suraksha Yojna (PMSSY). With the aim of correcting regional imbalances in quality tertiary level healthcare in the country, and attaining self sufficiency in graduate and postgraduate medical education and training , the PMSSY planned to set up new AIIMS institutions in underserved areas of the country. AIIMS , Bhubaneswar intends to conduct an interview of Indian nationals for contractual engagement for the following posts .Medical Officer ( Homeopathy) 01 post. 1. Age and all other qualifications will be counted as on 1 st November 2014 . 2. The period of experience wherever prescribed shall be counted after obtaining the prescribed qualification 3. The above vacancies are provisional and subject to variation. 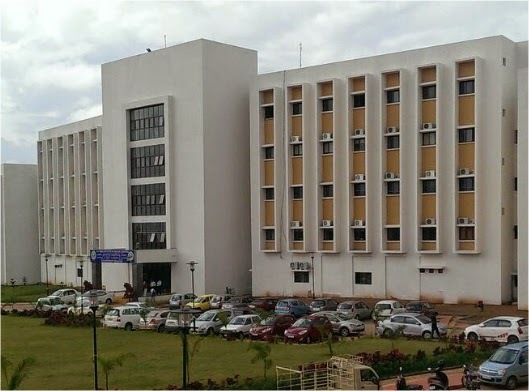 The Director, AIIMS, Bhubaneswar reserves the right to vary the vacancies including reserved vacancies as per the Govt. of India rules/circulars and requirements. 4. The reservation is as per Govt of India guidelines . (A) APPLICATION PROCESS: Advertisement and draft Application forms are hosted at www.aiimsbhubaneswar.edu.in. The printed copy of the application and the attested photocopies of all relevant certificates along with the originals must be brought at the time of interview. That all the applicants are requested to download the prescribed application form for various faculty posts on contracts basis from the website www.aiimsbhubaneswar.edu.in and send the same duly filled - in application with all supporting documents/certificates to : The Administrative Officer, All India Institute of Medical Sciences, Bhubaneswar, Sijua, Post : Dumuduma, Bhubaneswar - 751019 by Speed Post/Register Post on or before 15th November 2014 superscribing the envelope “ Application for Contractual engagement of Medical Officer (Ayurveda), Medical Officer (Homeopathy) & Yoga Trainer ” in AYUSH Department at AIIMS, Bhubaneswar along with the application fee of Rs. 500/ - for General /OBC candidates and Rs.200/ - for SC/ST Candidates in the shape of Demand Draft in the name of “ AIIMS Bhubaneswar ” for further necessary action. (B) FROM OTHER INSTITUTES : Those who are working in Central/State Government /Semi Government Autonomous body have to s ubmit “ No Objection Certificate ” from their respective organization along with their application. (C) ANNEXURES : Attested photocopies of Degrees, Certificates, Mark sheets, Age proof, Caste certificates etc. may be annexed to the hard copy of the application to be produced in original along with photocopy for verification at the time of interview. (D) AGE LIMIT : Age should not exceed 35 years for the all post s . Age is relaxable for Government servants, SC, ST and OBC up to 5 years and in otherwise exceptionally qualified/deserving cases. (E) VENUE OF INTERVIEW: Committee Room adjacent to the office of the Director, AIIMS Bhubaneswar. Candidates fulfilling all the eligibility criteria will be called for interview along with their original certificates/testimonials etc. . There will be scrutiny of documents by the screening committee. The candidates, who report after the specified date & time their candidature will not be considered. No TA/DA will be paid for appearing in the interview. (F) The engagement shall be on contractual basis for a period of Eleven Months or till the regular appointment being made whichever is earlier. The posts are purely on contractual basis and under no circumstances are linked to regular appointments and cannot be regularized at any stage. (G) The engagement shall be on contractual basis for a period of Eleven Months or till the regular appointment being made whichever is earlier. The posts are purely on contractual basis and under no circumstances are linked to regular appointments and cannot be regularized at any stage. (H) All the above temporary contractual positions shall carry a consolidated pay of Rs. 4 0 , 0 00/ - per month for Medical Officer (Ayurveda) and Medical Officer (Homeopathy) & Rs. 25,000/ - per month for Yoga Trainer. No other allowances will be paid. 2. Enrollment on the Central Register of Homeopathy or State Register of Homeopathy. Desirable: A postgraduate degree in Homeopathy from a Recognized University/Statutory State Board/Council or equivalent Recognized under the Homeopathic Central Council Act, 197 3 ( 59 of 1973 ) . 1. The candida t e who is already in government service shall submit ‘ No Objection Certificate ’ from the p resent employer at the time of Interview. 2. Canvassing of any kind will lead to disqualification. The prescribed qualification is minimum and mere possessing the same does not entitle any candidate for selection. 3. The appointment is purely on CONTRACT BASIS for a period of 11 months or till such time the regular appointments against these vacant posts are made, whichever is earlier, with effect from the date of joining. If the contract is not extended further, the same will lapse automatically. The appointment can also be terminated at any time, on either side, by giving one month ’ s notice or by paying one month ’ s salary, without assigning any reason or failure to complete the period of three months to the satisfaction of competent authority. The appointee shall be on the whole time appointment of the AIIMS and shall not accept any other assignment, paid or otherwise and shall not engage himself/herself in a private practice of any kind during the period of contract. He/She is expected to conform to the rules of conduct and discipline as applicable to the institute employees. The appointee shall perform the duties assigned to him /her. The competent authority reserves the right to assign any duty as and when required. No extra/additional allowances will be admissible in case of s uch assignment. 4. The appointee shall not be entitled to any benefit like Provident Fund, Pension, Gratuity , Medical Attendance Treatment, Seniority, Promotion etc. or any other benefits available to the Government Servants, appointed on regular basis. 5. The c andidate should not have been convicted by any Court of Law. 6. In case any information given or declaration by the candidate is found to be false of if the candidate has will fully suppressed any material information relevant to this appointment, he/she will be liable to be removed from the service and any action taken as deemed fit by the appointing authority. 7. The decision of the competent authority regarding selection of candidates will be final and no representation will be entertained in this regard. 8. Applications incomplete in any aspect will be summarily rejected. 9. The Competent Authority reserves the right of any amendment, cancellation and changes to this advertisement as a whole or in part without assigning any reason or giving not ice. 10. Leave entitlement of the appointee shall be governed in terms of instructions contained in DoPT&T ’ s O.M. No.12016/3/84 ‐ Estt.